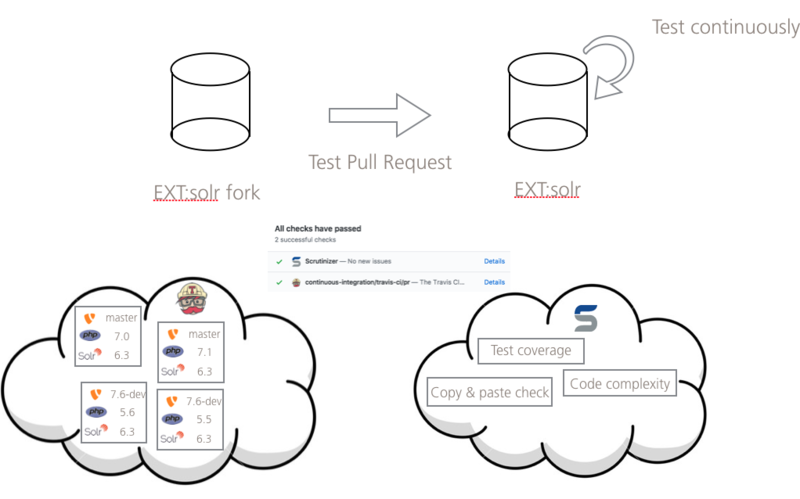 This is a summary of my talk for the TYPO3 developer days in Malmö «How we keep EXT:solr up to date with the TYPO3 core». Conclusion: In the end, everything needs to perform together to have a running search in TYPO3. To implement the technical mechanism above we use GitHub pull requests for every change (no direct push to any branch). Every pull request is checked by Travis-Ci.org and Scrutinizer-ci.com to help us to find problems with a change before it get’s merged. Important: The goal is not to blame anyone's changes. The goal is to keep EXT:solr running with all combinations! So if you want to start contributing to EXT:solr you can create a fork and enable travis-ci.org and scrutinizer-ci.com on your fork, and run these things even before creating a pull request. 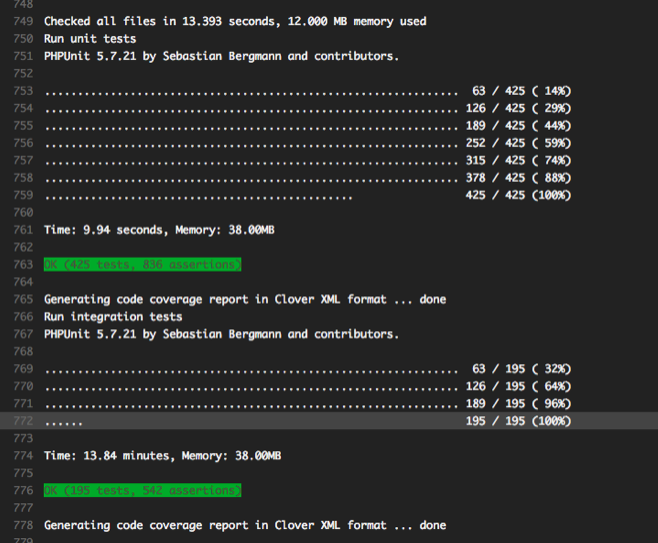 PHP Tests, that check if smaller units of codes (Classes or Methods) works as expected. PHP Tests, that cover bigger parts of the application. This defines the language of your project. In our case php. In the add-ons section, you can define additional things that should be available in your testing container. In our case, we install the parallel package that we use to run the PHP linter in parallel. In the env section, you can define environment variable that you need during the test. We define the environment variables here, that we use for the TYPO3 testing framework. We use them in our bootstrap.sh script to set them for the testing framework. In the matrix section, we define the combinations of PHP andTYPO3 that we want to use when we execute our builds. Each combination will create an own test container on Travis-ci. As we develop for dev-master, we can add this here as well. There are several build steps that we use to do different things. Last but not least we store the composer cache in a Travis cache to avoid the download in every build. We want to get a code rating and check for duplications. We evaluate the classes below Classes since the other PHP files return only typo related stuff where the structure is fixed. Build failure conditions allow us to define a boundary for a certain metrics that causes the build to fail. This is very handy when you e.g. want to make sure that the quality of an imported project will not get worse over time. There are a lot of services available around GitHub that allow you to run automated tests and code checks for free. This helps us a lot for EXT:solr to make sure the extension still works with the latest TYPO3 core versions. 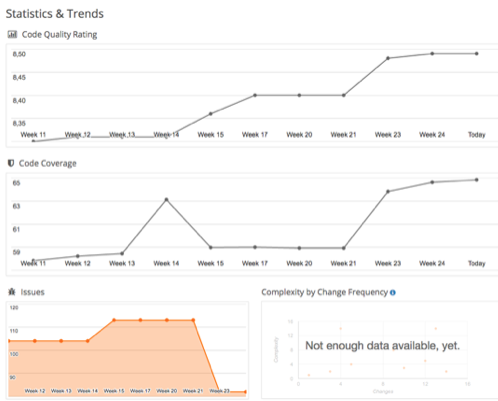 We started with adding these tests and improve the ci process over time. This enables us to integrate bigger features faster and reduces the effort for manual testing. The first lines of EXT:solr are 8 years old now :) Since the way how PHP applications and TYPO3 extension are build was improved a lot, we need to continuously transform the code to keep it update. This means we need to change the code continuously while keeping it doing, what it does before. Automated tests help us to change the code while making sure, it works as before. At the bottom you have a high amount of quick running unit tests that give you quick feedback when a smaller part of the code is not working as before. In the middle you have a medium amount of integration/functional test, that test bigger parts of the application but also take longer to run. 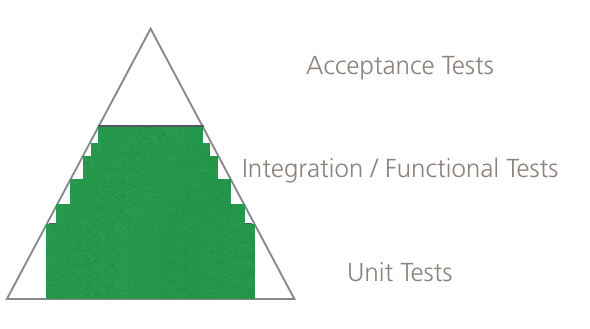 At the top you have a few acceptance tests that test the application from outside (e.g. the website with selenium) and do end to end test. The execution path is from bottom to top. Then the tests fail as quickly as possible and give you a feedback on that during the development. You need to have a disciplined development team that what’s to work in this way. To improve these automated tests we currently first add integration tests, that cover bigger parts of the application. Refactorings are already covered by integration tests. After adding unit test we also get a quick feedback on these parts of the code. Currently, we have around 400 unit tests that take 10 seconds to run, the coverage here is still less but should be improved over time. 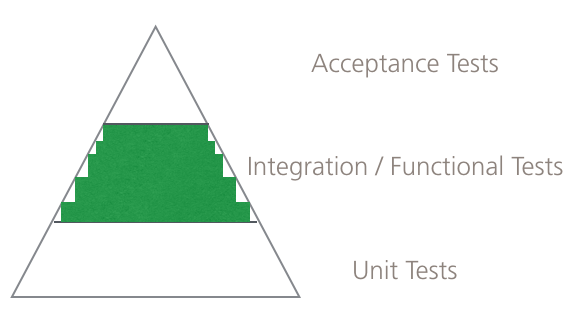 The integration tests take around 15 Minutes but cover bigger parts of the application. Together around 65% are tested automatically. This is a step in the right direction but still improvable. But nevertheless, we need to keep in mind, that doing all this manual would take days. we’ve implemented a PoC that implements a picture search based on nreach, solr and solrfal. It allows you to search for objects on pictures and also facet on attributes extracted by nreach. 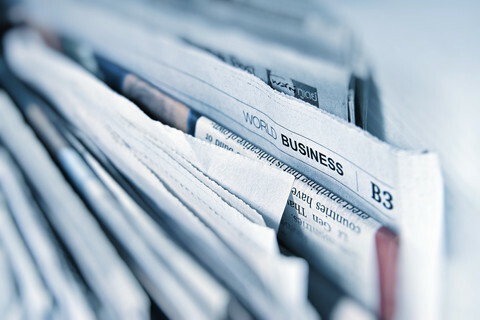 As you see there are several things we did to provide a release for TYPO3 8 LTS and we have also quite some ideas for the future. If you want to support us. Go to typo3-solr.com or call +49 69 2475218-0 and become a partner today!